PIN IT!We are in a new house and finally getting settled. The first thing on the to-do list? Revamping mine and my husband’s personal spaces. In this house, we decided to turn our fourth bedroom into a man cave. He’s stoked. For me, I’m turning my space into a minimalistic blogging slash yoga work area. I always have too many things on my desk so I’m hoping my plan will help maximize my space and minimize my stress. 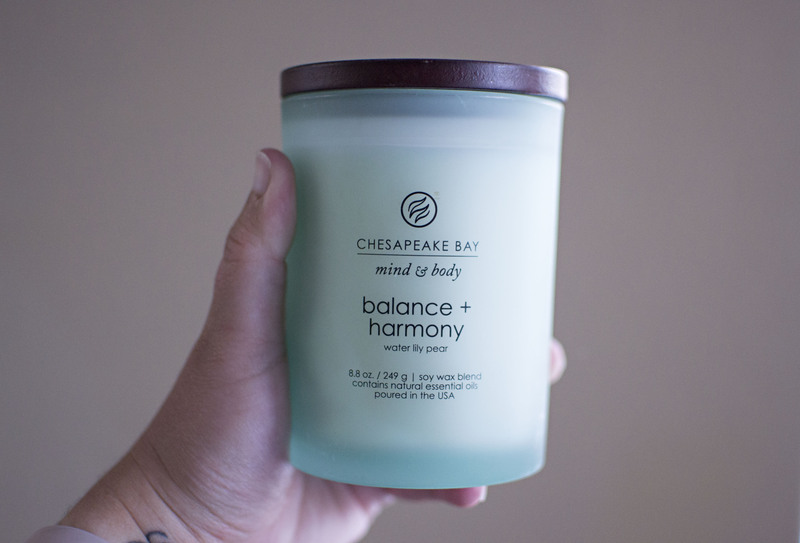 The one item that I knew I needed in my space was Chesapeake Bay Candles. 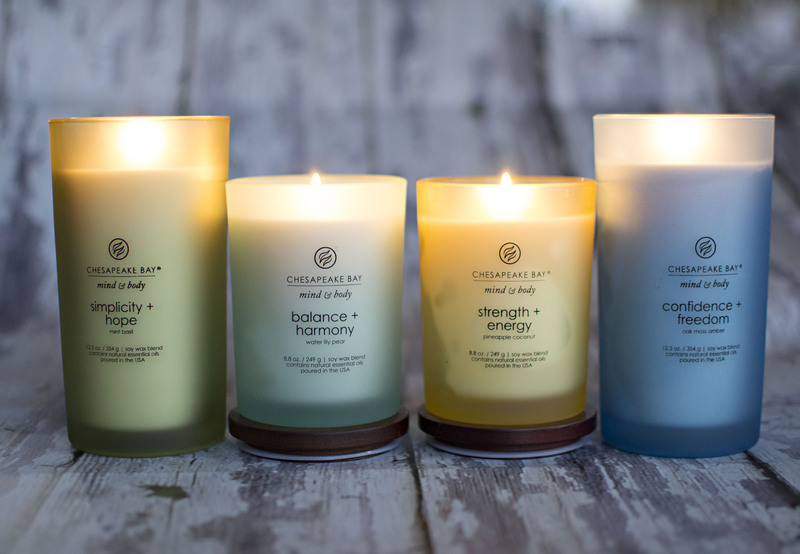 Chesapeake Bay Candle has curated a Mind & Body line of home fragrances that were inspired by our ever-evolving health trends. 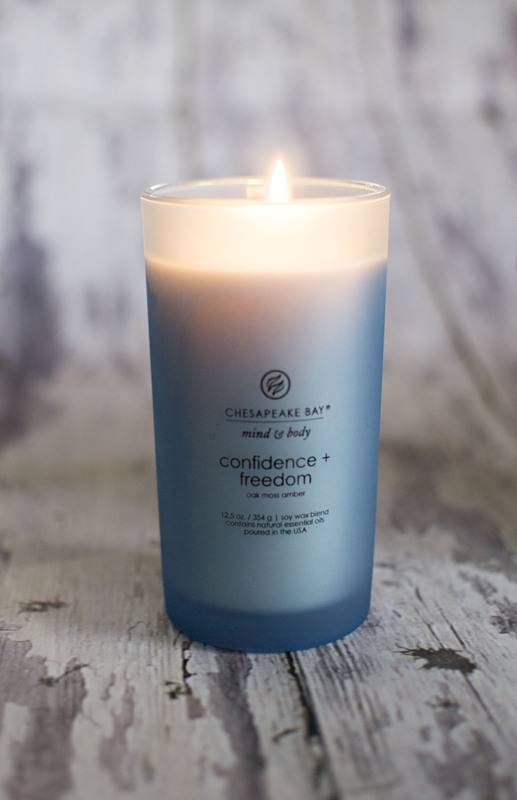 Chesapeake Bay Candle believes that everyone needs to slow down and find time for themselves. Their overall goal is to help people reach a state of balance and peace inside themselves. 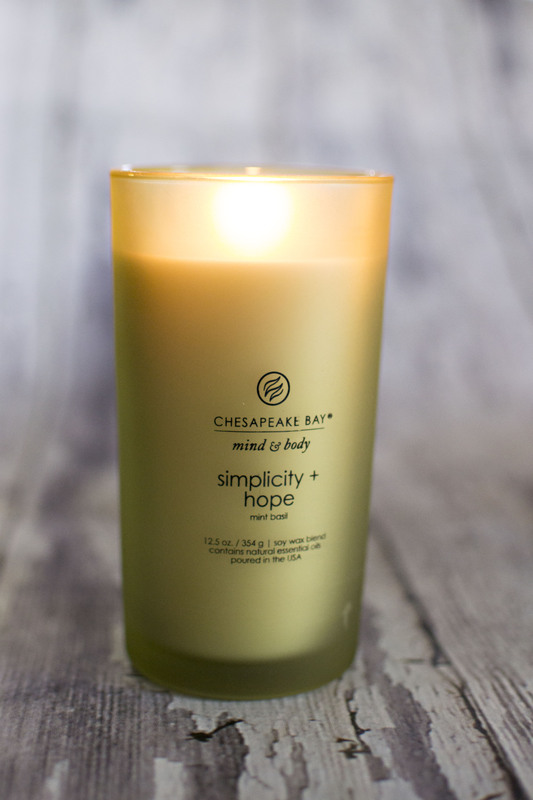 From yoga to organic products to an outdoor adventure, Chesapeake Bay Candle has hit the nail on the head. When I received my box of the Mind & Body collectionPIN IT! candles and cut the tape, the aroma of the line immediately grabbed my attention. They all smelled amazing and calming all at the same time. Every new candle I pulled out had me falling in love over and over again. The line comes in different sizes and scents and are perfect stress reducers. Best part? These candles are made with an all natural soy wax blend which means they burn clean! Oh, and the natural wooden lids and frosted glass couldn’t be more up my alley. Confidence + FreedomPIN IT! is a more musky scent with aromatic lavender and sage being brushed by white cedar and oak moss. Intensified with warm amber, oriental spice, and sensual patchouli, the fragrance reveals a touch of elegance and confidence. The candle contains all natural Copaiba, Fir, Lemon, and Patchouli essential oils as well. This was one of my husband’s favorite candles and he couldn’t wait to light it up! Dark blue – like the deep blue ocean, providing a feeling of freedom and excitement to discover the unknown · The soft colored frosted jar candles allow the light of the flame to shine through when burning· The soft colored frosted jar candles allow the light of the flame to shine through when burning. If you’re anything like me, you’re reading this and thinking mint basil? Really? Yes, really! I never in my life would have even considered sniffing this candle but I’m so glad I did. Simplicity + HopePIN IT! is an invigorating, herbal first impression of mint leaves and lime elevates spirits. All natural essential oils like Orange Terpenes and Patchouli paired with lavender, rose bloom, aromatic eucalyptus, green foliage, and spearmint revive the soul. Its beautiful green frosted glass is the perfect color to evoke the beauty of nature when lighting this candle. Balance + HarmonyPIN IT! is a combination of juicy tropical fruits, ripened peach, and delicious pear. This was my husband’s other favorite scent. I really loved the scent of creamy coconut and the aqua color brings a sense of balance to your interior. With Orange essential oil, rose, violet, water lily, and cyclamen all wrapped up into one, you can bring the outdoors in. You all KNOW this has my name ALL over it! Strength + EnergyPIN IT! couldn’t be more perfect for my yoga practice. I smelled this candle and couldn’t put it down afterward. Take my favorite scents of mango, pineapple, coconut, grapefruit, bergamot, and verbena to energize the senses. Surprisingly this fruity fragrance is actually based with an amber and musky vanilla. The orange, grapefruit, and lime essential oils bring a burst of energy to any room. If you’re interested in picking up the line for yourself, please do. 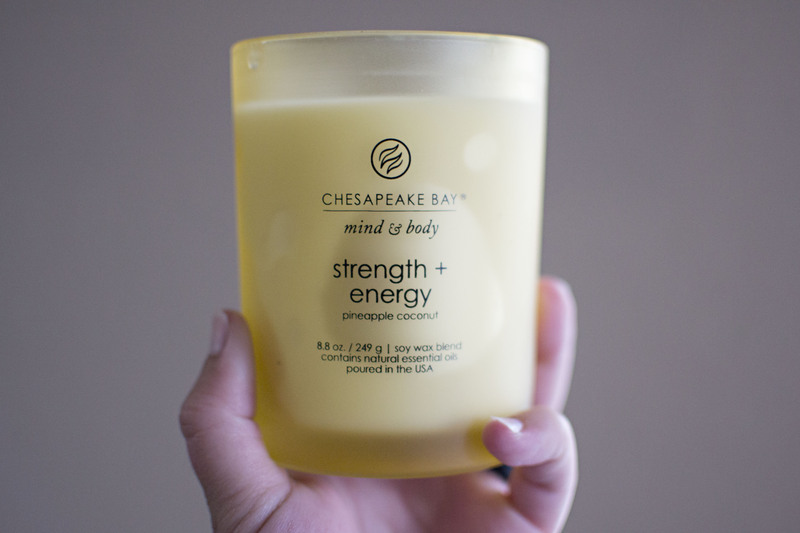 You can embrace your mind & body with such ease with Chesapeake Bay Candle. My little workspace has found its balance and I couldn’t be more grateful. I love candles and those scented candles are adorable. The packaging is really nice, the colors are relaxing. I am sure they will help anyone who’s looking for a good night sleep. 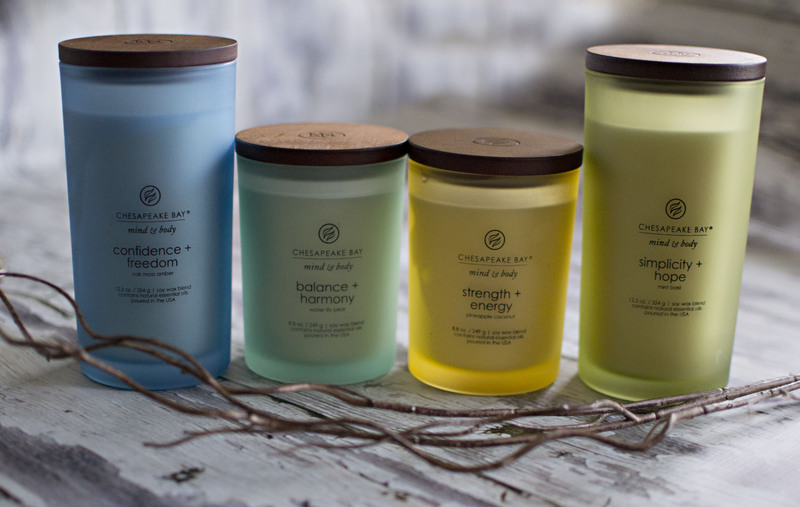 These candles are beautiful! I’m always on the look out for all natural candles with soy wax and essential oils! Oh, I am SO JEALOUS of your blogging/yoga space! (And even more so that it’s minimalistic!) I aspire to be a minimalist… maybe in my next life? Haha! These are so beautiful to look at too. I love the frosted glass. Kudos on settling in to your new soace.